Size of Male: 30-45 lbs., 20-23 in. Size of Female: 30-45 lbs., 18-22 in. The Border Collie is a breed popular for its superior intellect, boundless energy and ability to herd animals by giving them “the eye.” You may well see a canine workaholic in this breed, for it needs to do something all the time – apart from analyzing your moves! These dogs are so smart that they can teach themselves to unlock your gate and dash for escape! The “border” label in the breed’s name is not hard to figure out. You see, the dogs originated from the borders of Scotland and England. The pooch that sired the first litter of Border Collies distinguished himself in an 1873 sheep-herding showdown, using his hypnotic stare and not his nipping mouth. It was only in 1915, however, that the breed graduated from the generic “sheepdog” title. Today, this dog breed functions as show dogs, guide dogs and family companions, even though they can be quite testing to control for the inexperienced pet owner. Despite being described by some as “standoffish,” these dogs are affectionate and devoted dogs that thrive on human presence and interaction. If you leave them to themselves, they will suffer from separation anxiety which often manifests in destructive chewing and biting. The dogs are hard-wired to glare at and chase other animals, including strangers. Don’t expect your pooch to get along well with other house pets. This dog breed demands your full attention. They are not suited in homes with very young or elderly members. Living Environment – Apartment living is certainly not for this dog breed. These highly athletic dogs require a yard to romp about. You have every right to worry about the breed’s “escape artist” tendencies as well. A very secure fence and a hard-to-pick gate are necessary. Otherwise, you might see tragedy unfold in your neighborhood. These clever dogs just can’t help themselves from chasing after everything that moves and might kill cats and small animals out of sheer excitement. Grooming – There are two coat varieties for this dog breed. The soft-coated variety is short-haired throughout, while the rough-coated variety sports medium-length fur. Whichever coat your pet has, weekly or bi-weekly brushing is recommended. You may have to increase the combing frequency on select shedding periods. The dogs are medium, seasonal shedders. Diet & Exercise – Diet varies according to age. Pups require more proteins that must be reduced as the dog approaches adulthood. According to experts, a diet with at least 2.5 percent fiber and 10 percent fats is ideal for the breed. You may step up the servings and protein content on occasions when your dog has had a rough day out and needs energy replenishment. Few households are able to keep up with this dog breed’s extensive exercise needs. You must be able to combine vigorous physical activities with mental stimulation every single day. This requirement renders short-distance leashed walks ineffective. Biking, tracking, running and off-leash vigorous play in a secure area are more suitable activities. 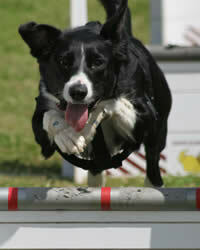 Health – For a breed so sporty, you may think the Border Collie is all buffed up in the health department. The truth is that the dogs are allergic to fleas and are prone to a host of health concerns such as chronic heart disease, epilepsy, deafness and canine hip dysplasia. Few of the dogs sport the genetic disease called “collie eye anomaly” which may end up in blindness. The veterans will tell you that Border Collies are highly trainable, but for the average person, the dogs can be quite difficult to handle and housebreak. This breed’s high intelligence is offset by their dominant streak, manipulative prowess, and sensitive and hyperactive nature. Respect training coupled with praise is mandatory. With an experienced trainer taking the lead, the Border Collie can upstage other breeds in competitive obedience, Frisbee, and search and rescue.